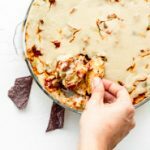 This vegan refried bean dip is a delicious recreation of a childhood favorite of mine. Circa 2002. My best friend's dad use to make an amazing refried bean dip with multiple layers and a tonnn of sour cream and cheese - we cannot forget the cheese. It was amazing. Bad for your health - but middle schoolers didn't care about that. 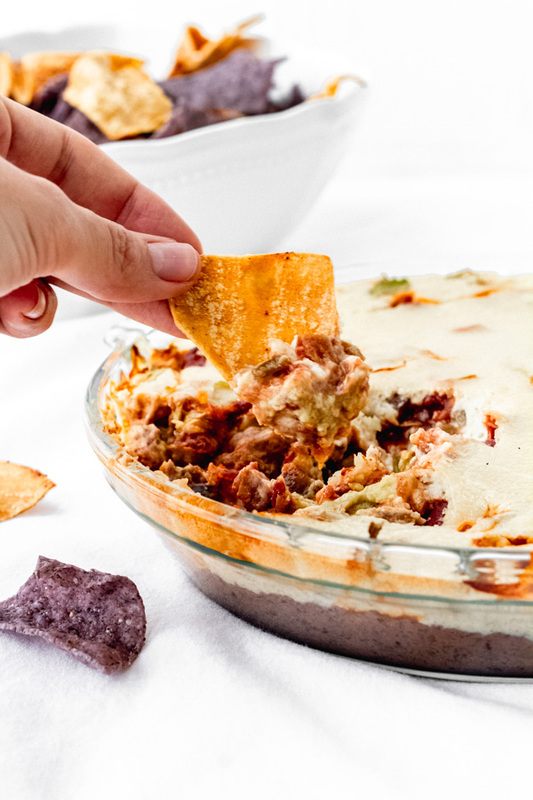 So fast forward a few years ( <-- more than a few), and while brainstorming what to create for superbowl weekend - I had a flashback memory of my favorite refried bean dip of all time. And why not recreate it but with healthier vegan ingredients? So from that, was born this. I did quite some research online regarding refried beans - the do's, the dont's. Whether to go for five layers or seven - mine ended up being six layers soooo I guess i broke that rule. 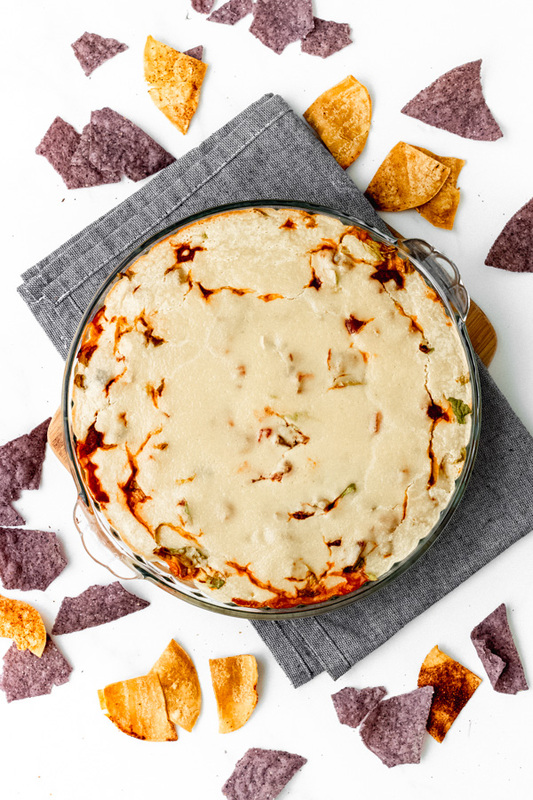 This dip is not your traditional junk food dip. It is made mostly from scratch with the exception of a few clean store bought ingredients. It is fresh. It is good for your soul. Layer one - Refried Beans: Starting with the base, we're going to use canned refried beans. If you're down to make your own from scratch - go for it. But in the name of keeping things simple, i opted for canned. I like my beans to be uber creamy in dips so in order to do that I like to heat the beans up a little bit on the stove, add some flavor by adding spices, and mixing in a bit of homemade 'sour cream' to get the creaminess factor. Layer Two - Homemade vegan chia 'sour cream' (or you can use store bought): I have yet to find a clean oil free sour cream at the store so for now I will continue making my own substitute. I really enjoy this chia sour cream because it has a slight acidic taste like the real deal, and the chia seeds give it a nice thick consistency especially when refrigerated overnight. I also get extra nutrition from the chia seeds! Layer Three - Homemade guac. Keeping things super simple here. One or two hass avocados smashed with a fork with a little bit of lime juice sprinkled in. Of course you can take it up a notch and try this more complex guacamole recipe that I posted last year - or you can buy some already made at the store. Layer Four - Shredded Lettuce. 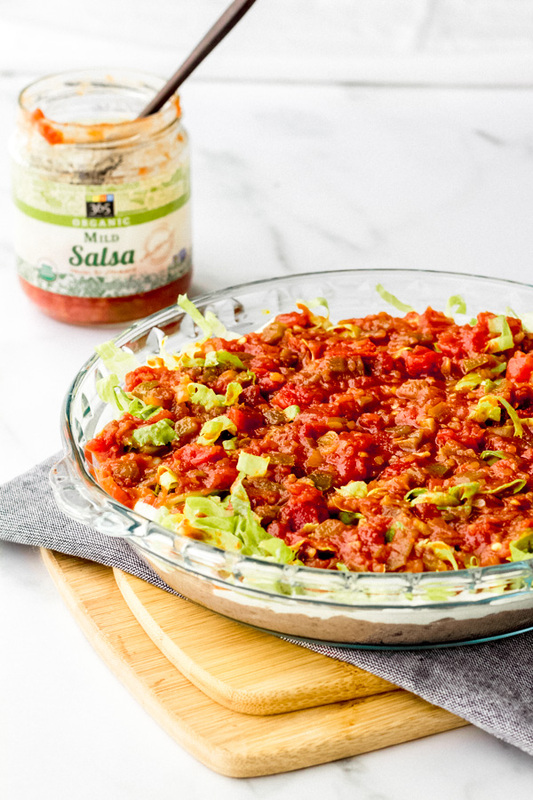 I realize that adding lettuce is not a very common thing to add to dips, and as a matter of fact, i'm prettty sure my childhood refried bean dip DID not have lettuce in it or else it would have *not* been my favorite dip (i hated veggies as a kid). 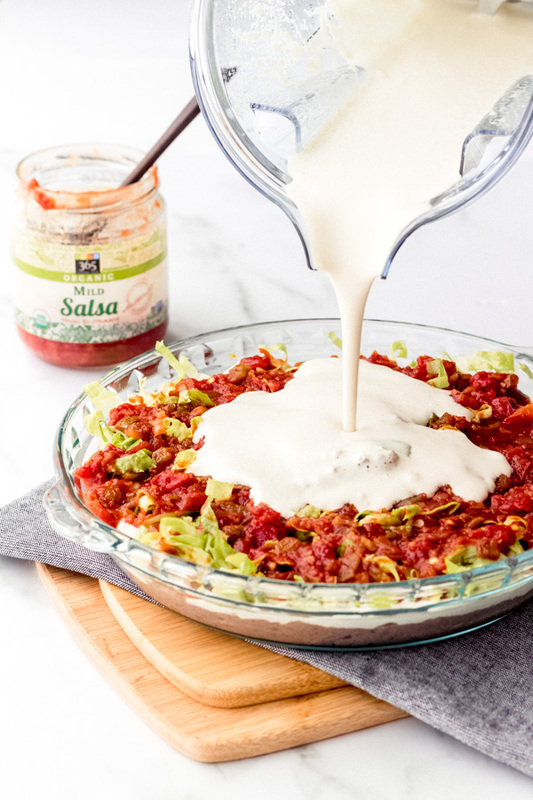 But this is a vegan dip after all and vegans mostly love their veggies so I figured it be nice to have the extra crunch from the lettuce and the beneficial nutrients added to the dip. Layer Five - Salsa. Mild, medium or hot.. your choice depending on your preferred level of spiciness. I went the easy route and bought a clean store bought brand. The one available at my local Whole Foods is organic and has basic clean ingredients. Layer Six - Melty and Stretchy homemade cashew cheeze. 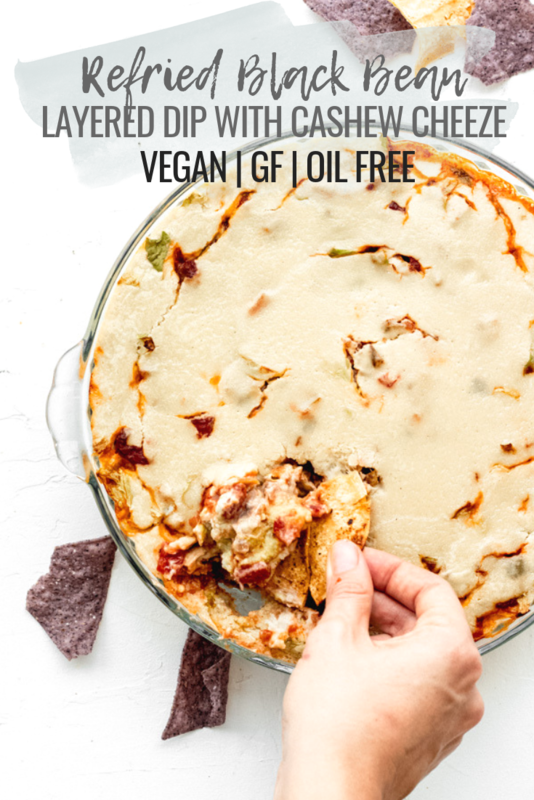 Of course you can buy store-bought vegan cheese if you prefer.. but if you're going for the non-processed oil free route definitely give this cheeze a try (listed in recipe card). It's sort of melty, sort of stretchy, and really tasty! Don't forget to buy some tortilla chips for dipping! Or make your own oil free kind like these ones. Anyway, enjoy your dip - either warm and fresh out of the oven.. or cold straight out of the fridge. I like it both ways. Want More Vegan + Oil Free Game Day Recipes? Try these Sweet 'N Sour Buffalo Cauliflower Wings or if you're in the mood for nachos, these are the Best Vegan Loaded Nachos Ever!